Organika Certified Organic Coconut Sauce is a great cooking alternative that promotes healthy fatty acid intake for better heart and cardiovascular health. 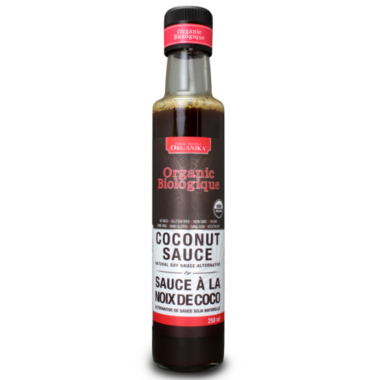 This sauce is gluten free, non-GMO, soy free, and importantly MSG free compared to other sauces – better for overall health! Directions: To savour the full taste, shake well before using. Ingredients: Organic Coconut Sap, Sea Salt. I have tried a few other brands of coconut sauce and this is the only one I enjoy. Limited ingredients that make it as natural as possible. Really tasty and sweet. I never need to use soy sauce or tamari ever again! This is the only brand I use, and I do like it - but every time I go to buy it, the cost makes me angry :/ I use quite a bit, as I use it in a couple of recipes, so it gets very expensive. This is the best tasting sauce ever. The first time I purchased it, I intended it as a soy sauce replacement. Turns out it's 400x better than any soy sauce.. Its amazing on rice and veggies and meat and everything else I have poured it on. Amazing flavour. I will continue to buy this!! This was my first time trying this product instead of the traditional soya sauce and let me tell you.... the moment I saw that there were only two ingredients which I could pronounce, was the moment I fell in love. It is delicious and has a bit of a sweet side. I will never go back to my unhealthy traditional ways!